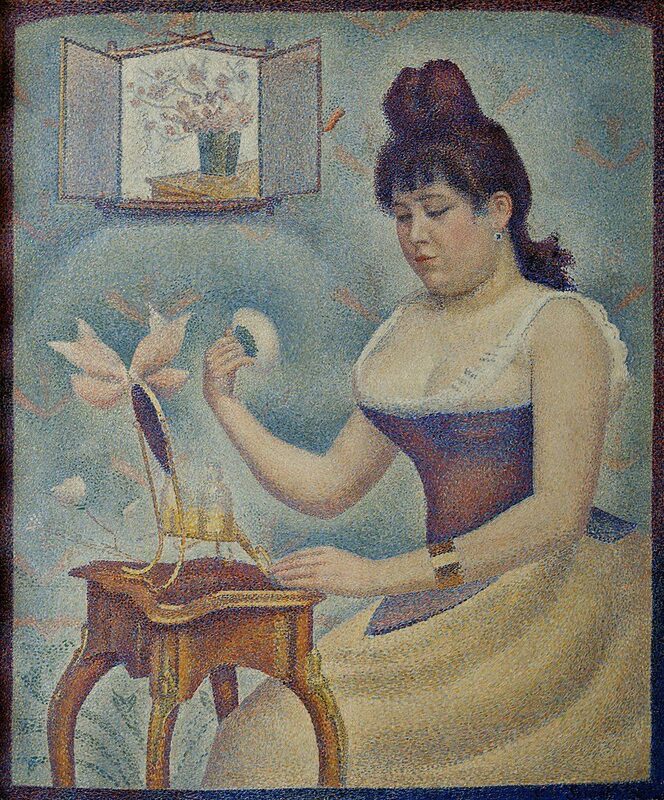 First Exhibited at the Salon des Independants 1890 along with Le Chahut, Young Woman Powdering Herself was almost ignored by the critics who were much more interested in Le Chahut. This is his only painting with a single figure as the subject and is something of an anomaly within his body of work. The title of the painting, would seem to suggest that this is a generic representation of young woman at her toilet. But this is not any woman, she is Madeleine Knoblock, an artists model who had been in a relationship with Seurat for a year or so. She was indeed pregnant when Seurat painted this picture. All this seems to have remained a secret from his family and his associates until his sudden terminal illness revealed the truth when the necessity for intensive nursing precipitated his arrival at his mother’s house with Madeleine and his infant son in tow. Madeleine was obviously a buxom young woman – she sits at her (exceedingly small) dressing table, her powder puff poised, ready for an application either to her face or perhaps to her voluptuous upper body. The choice of colour for her straining bodice almost suggests some metallic enhancement! The wall behind her seems to swell and recede due to the lighter and darker areas of paint; her face and extravagant coiffure is surrounded by a lighter corona and a darker background is applied above the crook of her right elbow whereas the shadow beneath her arm is juxtaposed with a lighter area below. This all ties in with Seurat’s colour theories concerning the proximity of differing points of colour (see Applying Science to Art). Madeleine’s dark hair, for example, is given emphasis by the application of lighter hues to surrounding in the background wall. Recent research by the Courtauld Institute has revealed that the picture of flowers attached to the wall may once have contained a self portrait at an earlier stage in the gestation of the work. The picture frame itself is a reference to the ubiquitous influence of ‘japonisme’ on French culture at this time.